Hello Chris -- thanks for telling me about this thread on that other discussion. Also I'm guessing you're the Chris who did that nice comment on my Scriabin video? Thanks so much for that too!!! By the way, in view of the above quote, I guess it's not surprising that you would like Scriabin! Ives was essentially my entry to "modern music." He made it easy because of his frequent use of familiar themes, however mockingly. Also the hilarity helped remove any factor of intimidation, plus just that his stuff is so cool. Introducing myself: I've been a serious pianist all my life, never professionally trained although I have been blessed with some high-level teachers (Malcom Bilson, Robert Silverman, Seymour Bernstein). I treasure my old LP collection, even though I must admit that at this point I look at it more than I play it! I've participated in many of the "amateur piano competitions" (with varying degrees of mixed success) and currently have an entry in the Cliburn YouTube competition. (The voting is over but you can still see the video -- link below) In terms of work, I'm a psychiatrist working in Manhattan and living in Westchester. My wife and I also have a place in the Berkshires (Great Barrington, Mass.) and we're pleased to be actively involved in the terrific music scene up there. I'm thrilled to have found this terrific site, and the story of my finding it is unusual and even a little bit embarrassing! I recently joined Facebook and one of the people I tried contacting was an old music acquaintance. I wrote him this long note -- but I had the wrong guy! But, would you believe, by coincidence this guy is also really into classical music, so my note almost made sense anyway! The person I wrote to happened to be Ricordanza of this site, and he got me on here. I've never been gladder about a mistake. Last edited by MarkC on Tue Dec 08, 2009 2:13 pm, edited 1 time in total. Last edited by Carnivorous Sheep on Wed Sep 28, 2016 12:49 am, edited 1 time in total. MarkCannon wrote: Hello Chris -- thanks for telling me about this thread on that other discussion. No thanks whatsoever, just happy to show you around.... just doing what others have done to when I first stumbled in here. And yes, I am ChrisMoonmadness on YouTube... I urge everyone to watch Mark's Scriabin performance (it is in his signature). I am absolutely no expert on Scriabin's music and how to perform it and am easily impressed when I see people performing what must be complex music without using a score but this was very interesting to watch / listen. Welcome aboard, and don't feel intimidated by what you perceive to be the level of musical knowledge of some participants. All levels are welcome here, and despite lack of formal training, you'll find your knowledge increasing just by listening to music and participating in the discussions here. MarkCannon wrote: I'm thrilled to have found this terrific site, and the story of my finding it is unusual and even a little bit embarrassing! I recently joined Facebook and one of the people I tried contacting was an old music acquaintance. I wrote him this long note -- but I had the wrong guy! But, would you believe, by coincidence this guy is also really into classical music, so my note almost made sense anyway! The person I wrote to happened to be Ricordanza of this site, and he got me on here. I've never been gladder about a mistake. What Henry said. We have a lot of newcomers to the field. Jared, Matt, Larry, Sean, Fergus, and I'm sure I'm leaving out many worthy contributors. We have a lot of non-professionals who are long time listeners, as well as a few professionals and amateur musicians. A nice mix. So don't think you won't fit in. And best of all, we love to talk about our passions and help you spend your money! I mentioned that I had an entry in the current Van Cliburn YouTube amateur piano contest. The result just came out, and .......I didn't win. I didn't expect to, but what surprised me was that the winner was, well, a surprise. I thought I knew who the main contenders were, and she wasn't among them. Since I'm giving "bad" news about myself, I figured I'd balance it out by mentioning something good that I forgot in my earlier post. I'm just an amateur pianist but I do give occasional public performances, and was once lucky enough to get a review in the NY Times. And for someone like me, it wasn't half bad. Mark, I would be very proud of Mr Rothstein's review. Especially the last couple of sentences. Congrats! I hope you keep working away at the "88." Glad you found your way here. It sounds like the piano has taken over your heart! We are happy you are amongst us and that you enjoy this site very much. Welcome, Jim! Very interesting personal journey.......sorry to hear about the problems that made you stop playing the harp. May I ask (and hope "the site" doesn't mind) ........do you perhaps have some video or audio recordings of your harp playing that you could post? I'm a big fan of the instrument. One of my favorite pieces for any instrument is Boieldieu's harp concerto. I don't suppose you have that, but I always look for any excuse to mention the piece. BTW......no matter how many times I see or write the guy's name, I still have to always re-check the spelling. MarkCannon wrote: Introducing myself: I've been a serious pianist all my life, never professionally trained although I have been blessed with some high-level teachers (Malcom Bilson, Robert Silverman, Seymour Bernstein). I treasure my old LP collection, even though I must admit that at this point I look at it more than I play it! I've participated in many of the "amateur piano competitions" (with varying degrees of mixed success) and currently have an entry in the Cliburn YouTube competition. (The voting is over but you can still see the video -- link below) In terms of work, I'm a psychiatrist working in Manhattan and living in Westchester. My wife and I also have a place in the Berkshires (Great Barrington, Mass.) and we're pleased to be actively involved in the terrific music scene up there. amazing how often Medicine and Music keep company!!! Welcome to the boards, Jim. Kick your shoes off and set a spell. Whose got the corn likker? Pass that jug over to our new arrival! Never mind about your music! I wanna see your tats! Garrett (IcedNote) thought about getting a tat last year and we ooohed and aaaaahed over John's (Guitarist), which was awesome but doesn't seem to want to appear now. Am I to conclude from your youtube offering that you are a fan of countertenors? I like them too. Agnes Selby wrote: ......Welcome to CMG, Mark. I enjoyed your performance very much. It is amazing how often Medicine and Music keep company!!! Thank you, Agnes! -- and I appreciate your taking a look at the Scriabin. Corlyss_D wrote: ......Welcome to the boards, Jim. Kick your shoes off and set a spell. Whose got the corn likker? Pass that jug over to our new arrival! Considering that it was to Jtattoo, I thought the Marx Bros. clip was going to be HARPO! But I'm gladder that it was what it was, because, although I'm a Marx Bros. fanatic and have seen most of the films many times, I've never seen that one! And I had never seen/heard that actual version of Groucho doing "Lydia." I've heard the song many many times, and I know Groucho's "performance" of it in his late years from the LP "An Evening With Groucho" (which I have and which I've listened to many times). But, what a difference in that original. I was struck mainly by his movement, and his overall verve. This was one of their later films and not one of the more highly regarded. The image of it that I had (and why I haven't sought it out more) is that by then, the brothers were tired and jaded, and sort of going through the motions. That's certainly not the case in this clip. BTW......some of those lines.....how did anyone ever think of "mazurka in jazz"! If you look at the thread I referenced, you'll see the Muppets' send up of Lydia. I first heard the song on somewhere in my distant past, probably the Arthur Godfrey show as I seem to hear his voice in my memory, but associate it most with Klinger on MASH. He sang parts of it in an episode. Yip Harburg wrote the lyrics. They don't make 'em like that any more. Wiki has a nice article on it. Hi jtattoo! I have a number of tattoos, one of which I've attached. I wanted a treble clef in the style of HR Giger's surreal/biomech art--I think it turned out pretty well! Guitarist wrote: I have a number of tattoos, one of which I've attached. I wanted a treble clef in the style of HR Giger's surreal/biomech art--I think it turned out pretty well! What size is that tatoo? It looks to be about 4 inches....from the shoulder to about mid way to the elbow? A pint? That's nearly an armful!! it's a very stylish tatoo to have on your forearm, John.. Sorry to have been so slow in response. Had the "crud" over the holidays. Bummer, really wanted to practice between semesters. Such is life. Mark, I really enjoyed the Scriabin!! I wish I had the courage to venture forth as you did. Wonderful performance. As for the Boildiu (I won't bother to look up the spelling either), it's a lovely concerto. We have so little from that period. I never played it, the Ginastera Concerto was my forte along with the Handel B flat. I regret that my most of my recordings are on reel to reel!!! I think they sit up in the attic somewhere. It gives you an idea about my age......LOL. I try not to dwell in the past, so now the piano is my new best friend. A little bit of info on Harpo. He could play the harp, but not to the ability seen in the movies. He was too busy making movies and money to practice all those hours. He used to take harp lessons over the telephone with Mildred Dilling from NYC. Most of the dubbing was by the studio harpist, at that time it was Gail Laughton. If you watch carefully the dubbing isn't that good, many times his hands were in the wrong register of harp for what you hear. And of course, there are so many glissandos............................! Gail was a tremendous musician and unfortunately died much to early. I don't know who replaced him in the studio orchestra. It was a wonderful era, to have at your beck and call a huge symphony orchestra of top notch musicians. Most of mine are on cassettes, but yeah, you've got me beat! I keep meaning to transfer them to CD but never get around to it. I did get a couple of them done. I did observe closely, and had no clue. BTW.......I assume you're also the Jtattoo on Piano Forums? Yes Mark I am the one and same Jtattoo. And that was a slip, it was Gale I believe. Harpo could play and I think he even might have produced an album, but it would have been created with a great deal of editing. The only way I knew about the dubbing in the movies was my friendship with the some of the "big" name studio harpists when that system was still in place. The studio system in the 30s and 40s was probably better for the musicians than the actors. It was a very solid salary and steady work. The only drawback was the "on-call" set-up. You received a call and showed up at the studio and sight read the parts for the movie. Ann Mason Stockton once told me that you played the work three times. Once to identify and fix problems in the score (to match the video). The second time to make sure that was the intention of ALL of the people involved (imagine: director,producer, composer, production team etc!) and the third and last time you recorded the final version. When you think of the scores of the films from that era (Gone With The Wind, Wizard of Oz, the Bus.Berk extravaganzas,) it was quite remarkable. Great! I wanted to say hi over there too, but didn't because I wasn't 100% sure it was you (although indeed 99) plus, you seem to be maybe a little more gingerly over there and I wasn't sure you'd want to be "recognized." I wondered a little but not much, because back in the day (when I was still learning about "names" and stuff), there was a baseball player whose first name was "Gail." And the odd thing about that was, it wasn't like he couldn't help it; he sort of chose it. His actual first name was Boyd, and his middle name was Gail. For some reason (particularly of note since it was in such a macho-ish environment), he went by his middle name. I always found that fascinating. Great stuff, including the continuation where you told more about how it worked with the harpists. I knew from prior reading, like from contemporary reviews of Harpo's playing in their live performances, that Harpo at least initially was considered not that good, but I figured he must have improved later because of how he "played" in the films. I guess he didn't necessarily. ......I noticed in your recording the piano was a Bosendorfer and the setting was not a home. If you don't mind me asking, did you go to a studio for the recording? and do you have a Bosendorfer? I have never played one and now would like to have chance sometime. It was at the auditorium of a local conservatory (called the Music Conservatory of Westchester; I don't know what they don't just say Westchester Music Conservatory) where they happen to have this Bosendorfer as one of the house pianos. It's a beauty, and also the red background doesn't hurt either. Bosendorfers can be variable, but in my experience, when you find a great one, nothing beats it. I've played many solo recitals over the years and have often sought out a Bosendorfer that would be available to be brought in. I was just lucky in this case that they have a great one right there. And they also have a Steinway. Not bad for a local little place!! At home I have a Steinway B. I once considered getting a Bosendorfer, but besides the main reason which is $$$$$$, I wasn't that much interested because I felt it wouldn't be the greatest preparation for performing. While I do get Bosendorfers for performances when possible, usually I can't, and I feel that a Bosendorfer is enough different from "usual" pianos that it would be an issue. Oh......I realize this doesn't make sense unless I also mention that I think moving to a Bosendorfer when you're used to a Steinway is no issue at all; it's just the move in the opposite direction that I think would be. How do I explain it? Not easily. Thanks for asking......I love this subject of different kinds of pianos. I'd mention also that I prefer Hamburg Steinways to New York ones, but don't have one for sort of the same reasons, plus that it's hard to find Hamburg Steinways to buy in these parts and I would never order a piano that I couldn't try first. Very interesting! My teacher has a Hamburg Steinway at her studio at UT. Wonderful piano!!! There was a period of time in the 70s and 80s when both Steinway and Lyon and Healy (harp maker) were owned by CBS. They effectively ruined both instruments through poor management and cut backs in production. When I was with Columbia Artists, most of the pianists had at that time a clause in their contracts that specified the Steinway had to have been made in Germany. They wouldn't play American Steinways from that period. I don't know what happened in the Steinway division, but fortunately Lyon and Healy was purchased by an Italian harpist who not only restored the quality of the instrument, but has improved on it a great deal. ps I try to lay a little low on PW because although the "discourse" is entertaining, it sometimes gets a little out of hand (between a small handful of individuals). Hello Jim and welcome to CMG. I envy you. 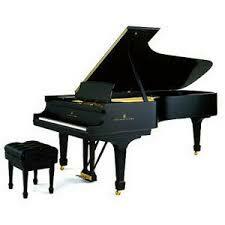 Not just because it's a Hamburg Steinway, but because my last two teachers have had pianos that I've hated. They would tell me stuff in lessons, and I'd say, hey, this isn't how I really play the piece, it's just the best I can do on this piano. That didn't make them real happy. I actually took to trying to have the lessons elsewhere as much as possible -- renting a concert hall or auditorium. Which of course was good practice anyway, and the teachers didn't seem to mind (much). I've dreamed all my life of being able to say something like that! I've been trying to do a little better job of doing that, with mixed success. • said anything else you might like us to know about you: Work in the software industry, going Yoda: many passions I have, music is a major one, I cannot commit myself to one genre, also love Jazz and (to a lesser extent) some pop/rock, definetely not commercial music though. Cool. I think we have another one or two from Portugal. Welcome to the boards. Kick you shoes off and set a spell. Post early and often. We have a lot of amateurs here, a few professionals, a couple of composers, and a lot of folks who love to talk about classical music. For your other musical interests, there's a couple of sticky threads in the Pub on "other" music, like jazz, world, rock, etc. and one on the Great American Songbook. Hope you enjoy your visits here. Don't be shy. GMG no longer works for me at my weekday location, so guess who's coming to dinner? Is your user name an initial, or a smile? BTW.....I didn't mean that smiley to be a smiley; I just typed ":" and then your name. MarkC wrote: Is your user name an initial, or a smile? BTW.....I didn't mean that smilie to be a smiley; I just typed ":" and then your name. Oh, that might be trouble eventually, eh? I'm David. Pleased to meet you. D wrote: Oh, that might be trouble eventually, eh? I'm David. Pleased to meet you. Hi David... a very warm welcome to our friendly forum! name as a few others here, one of the most ancient in the history of names. Thank you. 'Tis a fine name. -sign-on name is Jean...friends and family call me either by my first name, middle name or "mom"
- am not a practicing musician. My son is a professional musician (sax, clarinet, drums) and production engineer (earned his first gold album last year for work on a Barry Manilow CD which was recorded in concert). - I do not collect music (or pictures for the same reason) because I feel it is best experienced live and by serendipidous chance. - not a composer or music teacher.... have been a health ed teacher, adult ed computer teacher, and teacher to tax examiners for tax interest and penalty calculating. I am a serial entrepeneur who has enjoyed two very successful careers and the jury is still out on my current third change in career. I love music that is powerful and evokes emotion. I enjoy and appreciate nearly all genres except jazz, rapp, hip hop, gregorian chants, and very ethnic "world music". I am a "foodie" and I enjoy cooking, baking, and dining. I refer subtle flavors over strong, and dislike "hot" spices. I avoid all coffeee and tea as they destroy the pallette. One of my pet peeves is the use of photoshop to alter photographs. I am most likely to post on specific pieces of music, books, movies, business, the internet, the law, and odds and ends. Unlikely to ever post on politics. P.S. (edit) Thanks for your replies on both of the other threads. Last edited by MarkC on Fri Jan 15, 2010 12:58 pm, edited 1 time in total. And to make sure that this post remains relevant to the thread....I am very opinionated, but just as tolerant of any intelligent opposing opinions. Welcome Jean. You sound like a fresh voice who's not afraid of expressing yourself. We enjoy people like that. welcome Jean... a warm welcome to our (usually.. like most 'families' we have our moments.. ) friendly little forum. we hope you enjoy it here, and feel able to contribute.. Thank you gentlemen Very happy to be here.